When it comes to protecting a cars paint, there are a lot of ways to skin a cat – hypothetically speaking of course. One of the newest kids on the car care block is automotive paint protection film (PPF). Applied by professional auto detailing or vinyl installation experts, this thin polymer acts as a skin that helps to primarily protect the paint from rock chips and small scratches, but also UV exposure, mineral deposits, acid rain, and more. 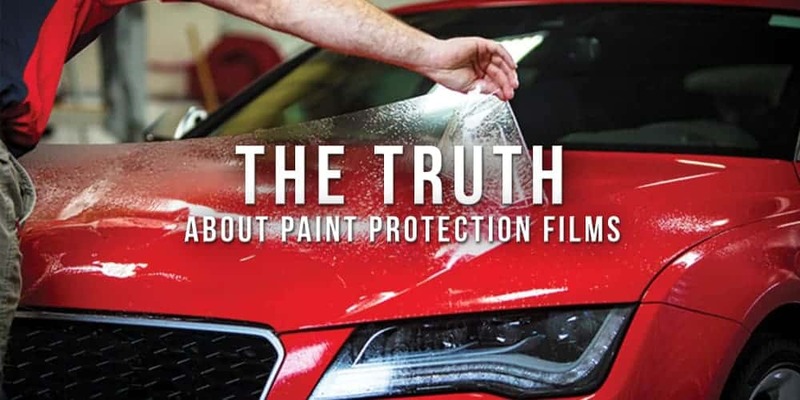 However, like any of the ‘latest and greatest’ automotive car care products, there is a ton of inaccurate information about the truth about paint protection film – some of it solid; others somewhat exaggerated. So – let’s weed through the BS and get down to brass tacks. What is the Difference Between PPF and Vinyl? How Long Does Paint Protection Film Last? What are the Pros and Cons of Using Paint Protection Film? How Can You Get the Most Out of PPF? What’s the Verdict on Paint Protection Film? 1. What is Paint Protection Film? Watch this cool demonstration on some of the benefits that paint protection film offers. Did you know that today’s modern automotive paint protection film was initially developed for military applications dating back to the Vietnam War? During the 1960’s, the US Department of Defense was experiencing problems with helicopter rotor blades and other sensitive military equipment being damaged by debris or flying shrapnel. This inspired them to contact the 3M corporation to develop a protective layer that was transparent and light-weight. Their solution was developing paint protection film (or commonly referred to as helicopter tape). Its first application was commercial, so it wasn’t really intended to ‘sparkle’. In fact, the first versions were incredibly dull – with a cloudy clear luster. But they did an exceptional job of protecting anywhere it was applied. Today’s automotive PPF has evolved into a high-quality thermoplastic urethane film that is applied to the top coat of painted surfaces of a new or used car. It’s available in multiple colors or an optically clear version, in a variety of thickness levels. The urethane clear film is highly resistant to acidic contaminants and corrosion, providing protection against bug splatter, bird droppings, mineral deposits, acid rain, and more. The unique material also helps it to reduce oxidization due to excessive exposure to the sun or UV light. The top layer of the PPF is comprised of an elastomeric polymer substance that helps the material maintain a natural shape once it’s been stretched or applied. This feature allows the PPF to “self-heal” when light scratches occur. The top layer of the PPF is comprised of an elastomeric polymer substance that helps the material maintain a natural shape once it’s been stretched or applied. This feature allows the PPF to “self-heal” when light scratches occur. What are the Types of Paint Protection Film? Clear Bra: This is the most popular brand name for automotive PPF products in the United States. It’s also the default name provided to general PPF – like “Ziplock” bags or “Post-It” notes. 2. What is the Difference Between PPF and Vinyl? There is a lot of confusion with understanding the difference between PPF and vinyl. In basic terms, PPF is a much thinner, and lightweight version of vinyl or what many people call a “wrap”. The wrap is a heavier substance, that is much easier to install, provides extra coverage, but is heavier and not very transparent. The PPF on the other hand is usually crystal clear, is much lighter, and self-heals when scratches occur. Another simple way to explain the difference is that vinyl is usually applied for stylistic improvements, while PPF is a protective application. The video above does a really good job of comparing the two. 3. How is Paint Protection Film Installed? If you’re going to have PPF installed, there are a few options – but regardless of which one you choose, it’s always a professional job. Most of the professional PPF installers are also vinyl wrap or custom autobody services. The larger companies use a machine called a plotter – which actually pre-cut the vinyl in sections which makes installing much easier and form-fitting. However – the majority of professional PPF installation companies are forced to use a bulk roll of film, which complicates the installation process and actually leads to a lot of wasted material. 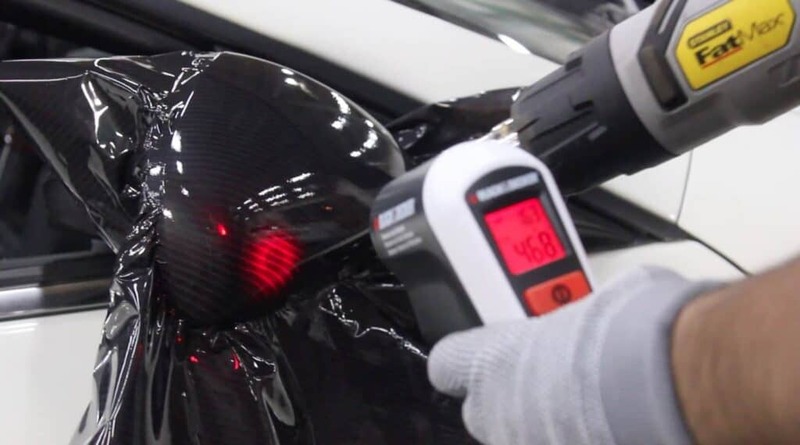 The installation process is always unique and customized based on the brand or paint protection film; as each manufacturer has different procedures they recommend. Clean and prep the surface. Most installers use a good degreasing agent to remove debris, but not remove wax or polish. In fact, some will actually complete a detailed wax and polish before installing to improve the shine. Cut the PPF material to fit sections: Once the car paint is prepped, the installer will cut PPF material for an installation. It’s similar in design to window tint. Most of the time, they will install in sections, such as a hood, rocker panels, quarter panel, side mirrors, door, or other section less than 5 feet square. After they’ve cut the film, they’ll line it up and prepare for installation. solution. This allows the PPF to activate a ‘glue-like’ substance, which is what causes it to stick to the paint surface. Again, depending on the brand of PPF, the fitting solution can range from simple water to a soap-like substance. Fitting and applying: This is where the experience comes into play. PPF doesn’t just fit perfectly when it’s applied. In fact, it’s a lot more complicated to install than vinyl. The process of installing PPF involves a series of spraying – squeegee – and moving the PPF. When it’s in the right position, the installer will use the squeegee to remove bubbles or creases in the film. Drying: Once the PPF has been applied, and all bubbles and creases are gone, the final step is drying or heat-activating. They use an industrial heat gun which activates the adhesive and causes the PPF to stick to the body. It also shrinks the material and creates a tight fit. 4. How Long Does Paint Protection Film Last? Arguably the best attribute of paint protection film is longevity. According to 3M, the folks who invented and continue to dominate the market, professionally installed PPF should last from 5 to 10 years. In fact, these products often receive a warranty if the installation company is certified. Like car wax or any paint protection – there are several variables that impact product longevity. The surface prep: While PPF is a protective layer, it’s only as good as the surface underneath. Prep work is often the most time consuming, but important steps for installing PPF. The application: Installing PPF is a complex and delicate procedure. If there are bubbles or creases in the material, it will warp – and not adhere correctly. The smoother the installation – the longer it will last. Environmental factors: One of the best attributes of PPF is its ability to hold up against heat. But, too much exposure to direct sunlight will decrease lifespan. It’s also important to understand that PPF is not bullet proof. If it’s continually exposed to debris, blowing sand, bird droppings or other damaging materials, it can wear thin. 5. What are the Pros and Cons of Using Paint Protection Film? So – this video provides some good insights – but it’s a manufacturer’s “sales pitch” – so take it with a grain of salt. PPF is a great product for protecting paint and extending the lifespan of any vehicle’s surface. However, it’s not without flaws or some disadvantages. Listed below are a few of the pros and cons of using PPF. Superior protection against rock chips. Prevents a lot of scratches from reaching paint. Can last up to 10 years in some cases. 6. How Can You Get the Most Out of PPF? 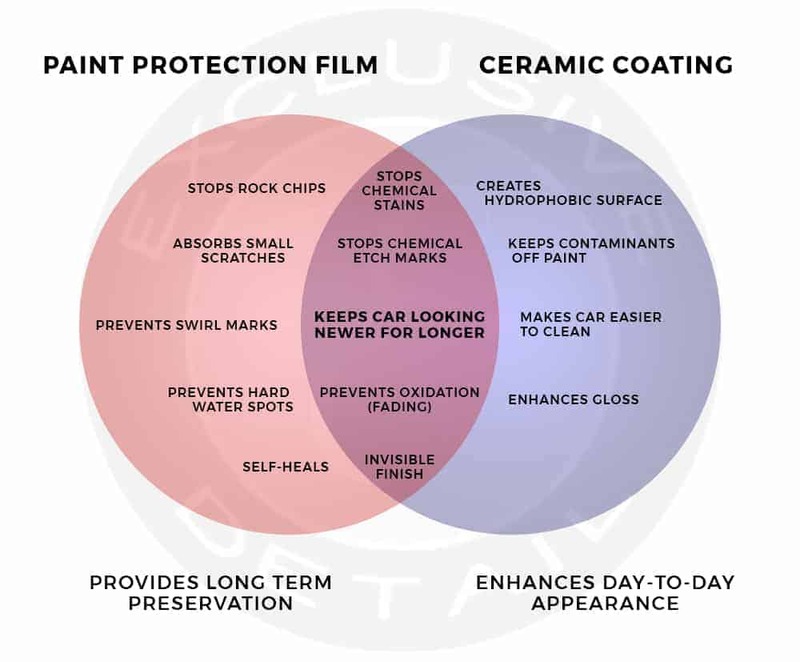 If you look carefully at the CONS listed above, most of them can be resolved by combining two products – PPF that is protected with a ceramic coating. Helps to improve the shine: PPF is notoriously dull – and over time, tends to produce a yellowish hue. To improve the luster of the paint and clear coat, many car owners will either apply a ceramic coating on top of a fully PPF wrapped vehicle or install a PPF “Clear Bra” on the front grill and hood, with ceramic coating applied on the remainder of the car. Improves Hydrophobic Properties: Another disadvantage of using paint protection film is that debris tends to stick to it quite well. This is because it’s not very hydrophobic. The solution to this issue is to apply a DIY Nano-ceramic coating on top of the PPF. Fewer Car Washes: When the PPF is more hydrophobic, less dirt, debris, water spots, bird droppings, and other contaminants will stick. This helps to reduce several the number of car washes needed – which saves money. Reduced Need to Wax: Along with reducing car washing, a ceramic coating combined with a PPF also leads to fewer trips to the detailer. As you can see, PPF is a fairly good product for protecting the exterior of your vehicle from rock chips and other debris. But there are still several questions that potential consumers often ask – mainly about the installation. Here are five for your review. Q- What is the most important factor in choosing a PPF installer? A – Experience matters; especially installing PPF. This product is very difficult to install correctly, which is why it’s always best to work with a proven and certified PPF installer. Q – What type of warranties are available with PPF products? A – Depending on the product you use, and who installs it, PPF can come with several warranties. Some of the most common range from 5 to 10 years on defects. Like all warranties, it’s important to review the fine print details before making a decision. Q – Are there certain PPF products better than others? A – Clear Bra is the leader in the industry. Mainly because it’s durable and installed in specific areas of the paint surface – as opposed to the entire car. Q – How Expensive is PPF? Q – Are there better alternatives to using PPF? A – It really depends on why you’re using the PPF in the first place. If you’re looking to protect against rock chips and scratches, PPF is arguably the best product to use. However, like we said above, the smartest consumers use PPF on the front of their vehicles, on side-view mirrors, and other areas prone to rock chip damage. 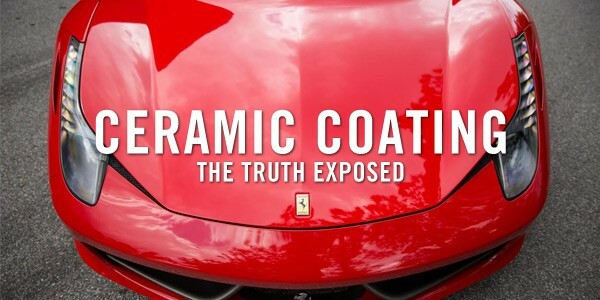 However, if you’re looking for the best way to protect the paint from UV exposure, bird-droppings, water, dirt, grime, and other contaminants, a high-quality DIY Nano-ceramic coating with a precision-installed PPF is the ultimate shield. A Nano ceramic coating is a liquid-polymer derived from silica and is commonly used in the manufacturing of ceramic or glass products. The word “Nano” refers to the microscopic size of the molecules or particles in the coating itself. Because the particles are so small, when applied to a surface, they seal all the microscopic peaks and valleys found in paint and clear coats, making the surface completely flat, hydrophobic (water-repellent), but also resistant to UV, scratches, chemicals, extreme heat and even graffiti. If you’d like to learn more about Nano-Ceramic Coatings, we’ve got a really awesome article for you to read. 8. What’s the Verdict on Paint Protection Film? 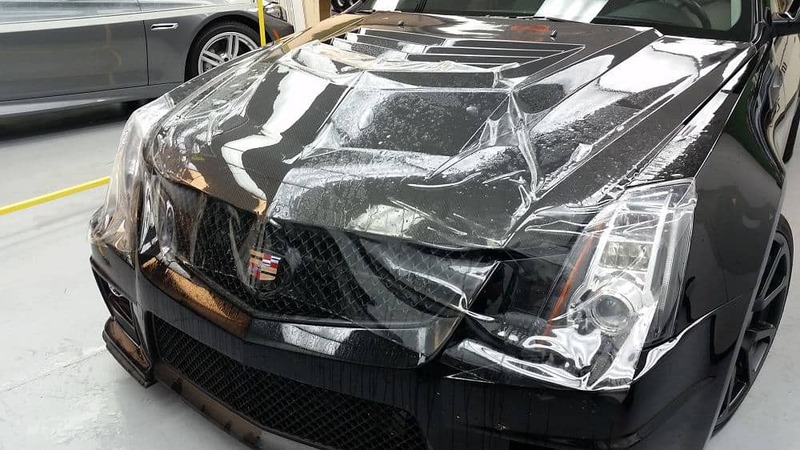 Paint Protection Film or PPF is an exceptional way of protecting the front of any vehicle from damage caused by small rocks and other road debris. It isn’t intended to enhance the shine or luster of your vehicle, nor is it very good at keeping the vehicle cleaner. The important item to remember is that PPF is not bulletproof, or the ultimate layer of protection that some people think.